Summary: Microsoft Scripting Guy Ed Wilson discusses his version 3 of a Windows PowerShell WMI helper module. Microsoft Scripting Guy Ed Wilson here. I have really enjoyed working on my HSGWMIModule project this week. On Monday, I created the base WMI module, and included a couple of really great functions that query the WMI schema and return WMI class methods and properties. On Tuesday, I added a function that returns the key property of a WMI class. This is useful when working WMI instance methods. Today, I create a function that will return the values of those key properties. There are times when I only need to know the key property of a WMI class, and there are other times when I want to see the path to all the possible instances of a WMI class. Today’s function addresses these situations. Note As I did in the two previous Hey, Scripting Guy! 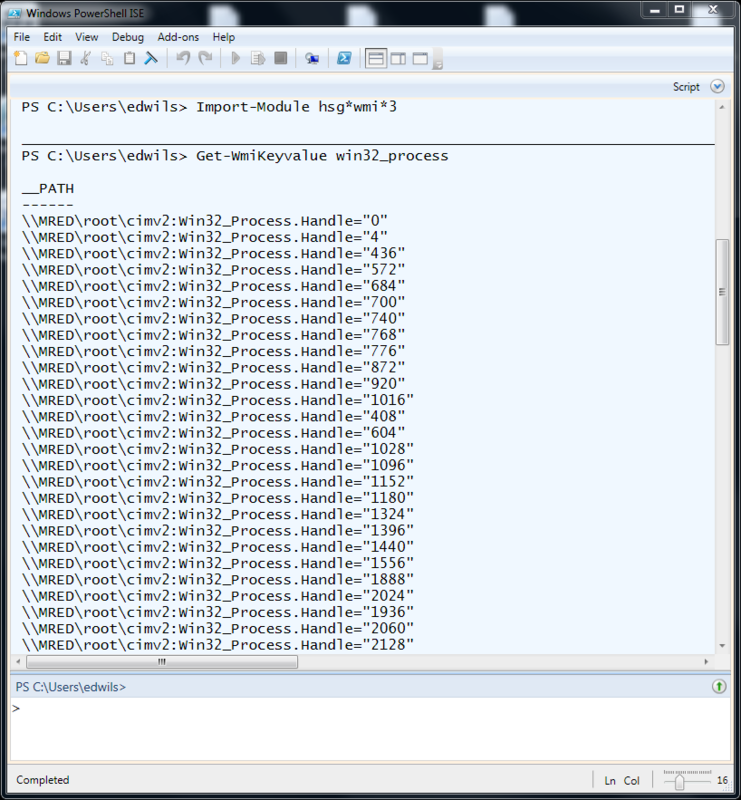 Blog posts, I have uploaded the current iteration, version 3, of the WMI module to the Scripting Guys Script Repository. To use HSGWMImoduleV3, I first must “install” it. Installation is simple; I use my Copy-Modules function from the Windows PowerShell ISE Profile and Modules project I wrote. I discussed this on Friday, October 21, 2011. Note If you need more information about Windows PowerShell modules, see this collection of Hey, Scripting Guy! posts. After it’s loaded (imported), all the functions contained in the module load onto the function drive. As shown in the following figure, I use the Get-WMIKeyvalue function to find the path to instances of the Win32_Process WMI class. Most of the lines in the Get-WMIKeyValue function are comment-based help. Therefore, when I use the Get-Help cmdlet, as shown in the following figure, nicely formatted help is displayed in the output pane. I call the Get-WMIKeyValue function by passing at least the WMI class name. The Get-WmiObject cmdlet retrieves the class, and pipes the management object to the Select-Object cmdlet where I choose the __Path system property. The __Path system property returns to the caller of the function. Well, that is about all there is to the Get-WmiKeyValue function. Download version 3 of the WMI helper function module from the Scripting Guys Script Repository, and let me know what you think. If there are things you would like to see, just let me know. See you tomorrow.